A little over a month ago, I was horrified when super-blog BoingBoing brought attention to a cake with a half-assed likeness of the Death Star. I won’t reprint the pictures here, but follow the link and see if you can come up with a better description than this: Large, pre-historic ball of turd with a dent in the side. UPDATE: Consummate good sport Ruth, creator of the maligned Death Star cake, stops by the comments section and points us to other, legitimately- and comedically-pathetic Death Star cakes. Now, it’s not that I don’t appreciate the sentiment. I mean, hey! It’s a Star Wars cake! That alone is worth a hearty slap on the back. 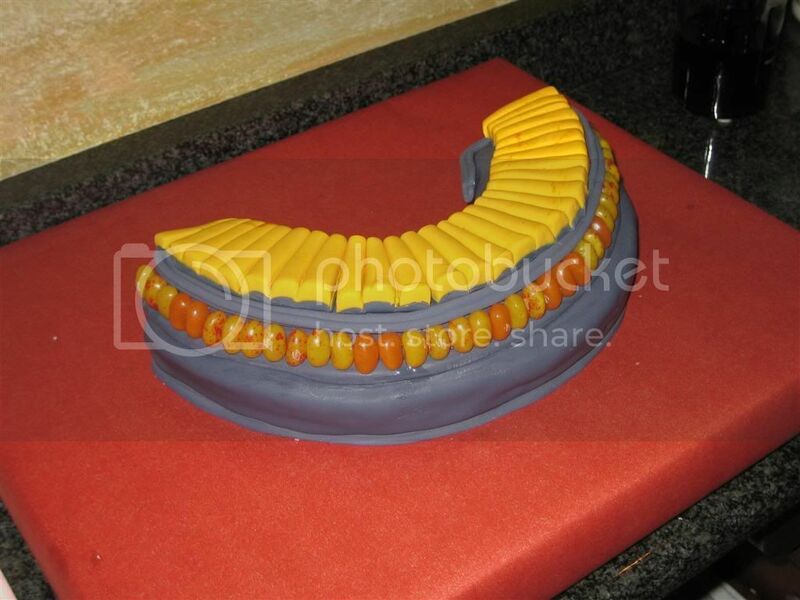 But of all of the amazing cake artistry out there, this is the one that BoingBoing decided to post? Questionable, at best. The timing couldn’t have been better. I wanted to be able to say, “Now that’s a Star Wars cake,” and she wanted to make a cake for my brother’s birthday. That my brother had no particular interest in a Star Wars-themed birthday cake had little bearing on the matter. After much deliberation over what shape the cake should take (X-Wing fighter? Jabba the Hutt? Star Destroyer? Greedo? ), we settled on Max Rebo, the keyboardist in Jabba’s palace band. The result was fantastic. 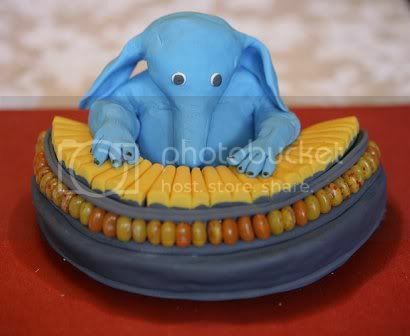 UPDATE: Boingboing’s coverage of the Max Rebo Cake, including mildly-hilarious cake controversy. My brother’s birthday coincided with my visit home to the East Coast this past weekend, so I was able to photo-document the “before” stages. My brother shot the “after” pictures… see if you can figure out which one of us actually knows his way around a camera. What would become the keys on the keyboard. Early stages of Max’s body. The body, in place. 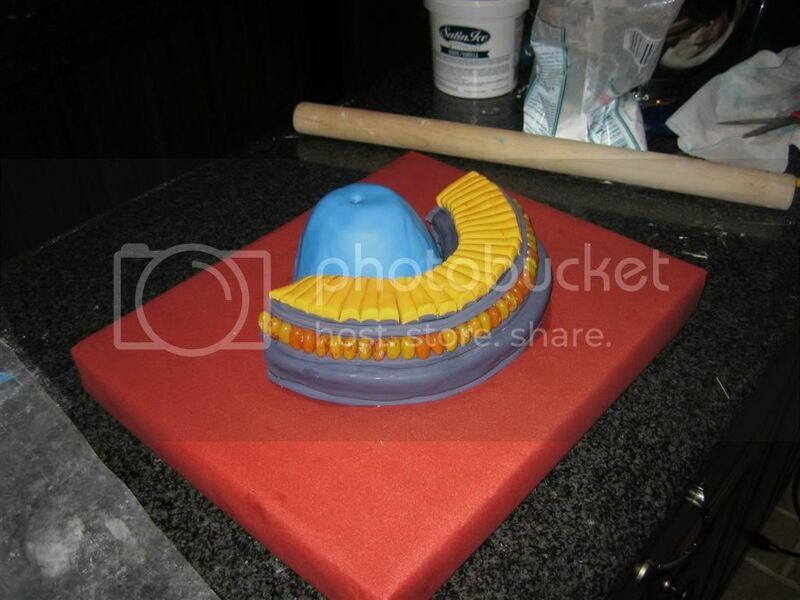 That hole on top was for the toothpick that secured the head, which was made entirely of fondant (icing). 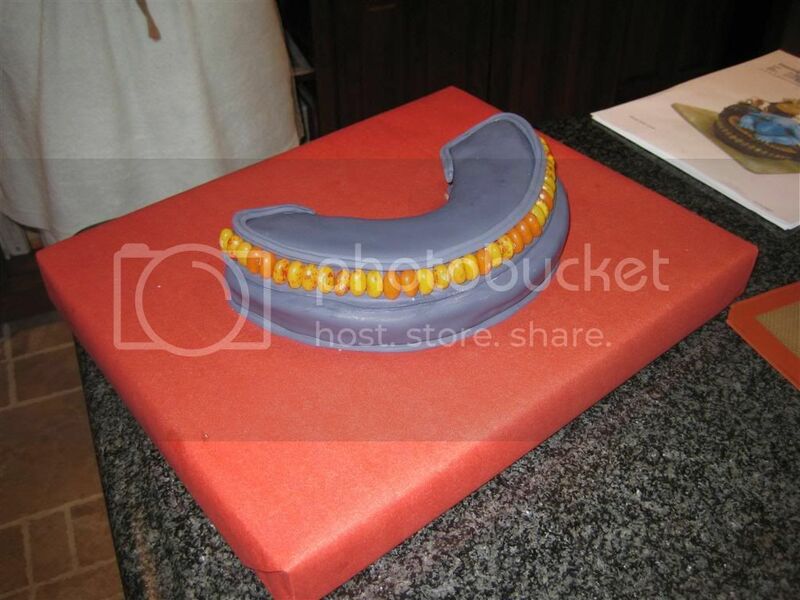 The cake was 100% edible… yellow cake and fondant (icing). In the final act of this homage to Star Wars, I did my best imitation of the Rancor beast, ripping off Max’s arms and then eating them, grotesquely. I’ll spare you from those pictures. Yeah, but what are the parts MADE of? What’s the yellow stuff? What’s the blue stuff? The internet demands answers! Um, that’s amazing. 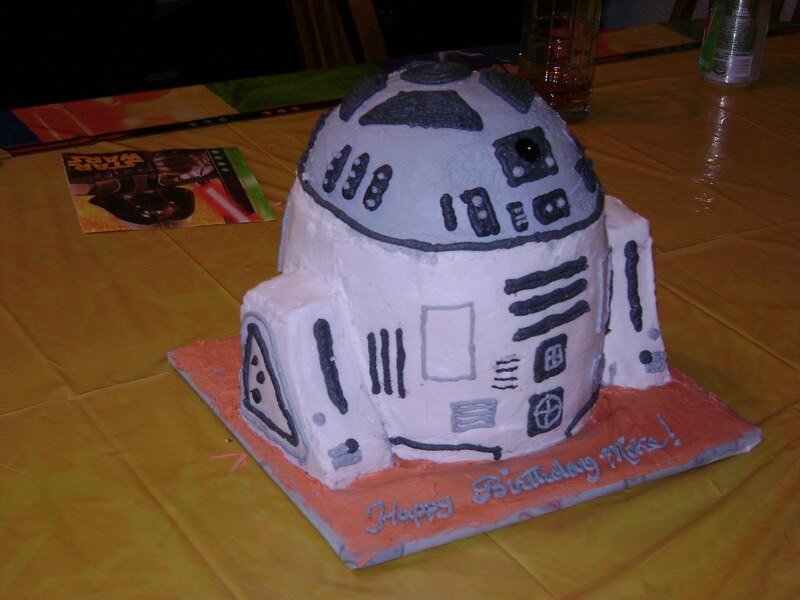 I mean, now *that’s* a Star Wars cake. But maybe it’s actually a Return of the Jedi cake? I actually thought the Death Star cake looked like one of those Nerf soccer balls. Every single one had a little chunk of foam missing, just like that dent in the side. Heh. I’m the Death Star cake creator. I’m totally not a cake artisan, although I have to add that the Death Star is about the least crafty one I’ve done. It was for two purposes: 1, the obvious “woohoo, Star Wars edibles!” as you point out, and 2, to prove to a coworker that I could make a round cake. (Ball pan, duh.) I only spent about an hour airbrushing it since I’d spent most of my time that night doing the guitar, which was the official birthday cake that day. But if you *really* want to see half-assed, I found a picture online the other day, which I decided against linking for the sake of the proud creator. If it hadn’t been labeled Death Star, I wouldn’t have known. It was pretty much a regular 8-9″ round cake (so not spherical) with black lines piped in a grid across the top. Switched to yellow, I’d have been closer to accepting it as a holodeck cake instead. The Max Rebo is awesome, but Greedo would have been way cool. I’m thinking about doing a Millenium Falcon in August. Yummy! Props to your mom for a great looking, uber-geeky cake. I second that. But your mom is a close second. I’m so jealous. I want one for my birthday. Your mom rocks! Yeah, my Mom is cool. I am merely desperately geeky. I know. But we put up with you anyway. Hope it’s OK that I posted this–with grande links, of course–on my own blog. Aaron, per the captions (remember, reading is fundamental), the whole thing is yellow cake, regular frosting, and fondant… which is a harder icing that is commonly used on wedding cakes. It’s edible, you just don’t want to eat a lot of it. 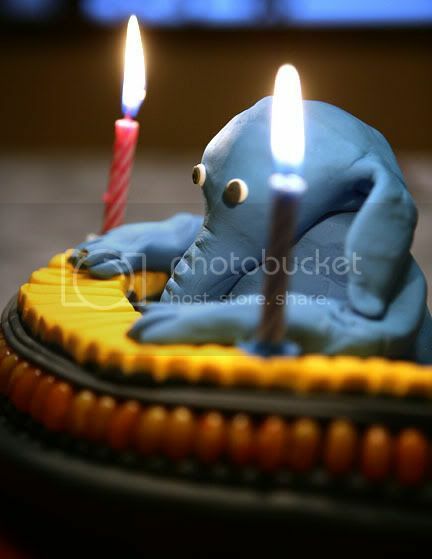 For instance, I wouldn’t recommend eating Max’s head, which is one big hunk of fondant. Sung Hu, I third that emotion. Jenny: Thanks, yo! I take that as a compliment of my idea and orchestrating of the event, rather than a compliment of my Mom’s considerable cooking skills. Hi, Ruth! Glad to hear from you. I couldn’t find the exact Death Star cake you referenced, but I found another hilariously-pathetic one, so I’ll update my post. The Millennium Falcon was actually on our list of possibilities, as well… I think that could be cool… cheers to you. Just wanted to tell Cass to consider Ruth’s honor intact. As I said in my note to you and in my blog, I applaud her efforts, but occasionally I indulge in a bit of hyperbole. 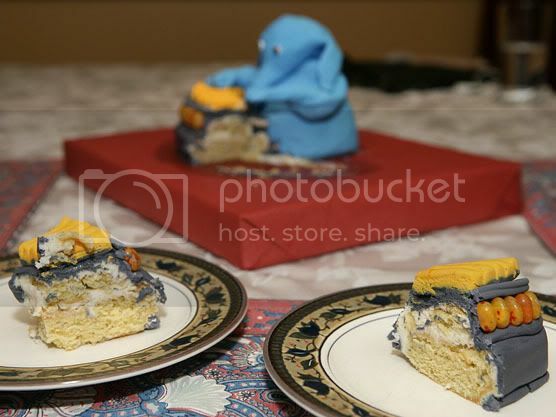 For instance, of course Ruth’s cake looks better than a turd (I’m just really bad at analogies and commonly resort to poo jokes), and my Mom is a cake artisan as much as she’s a cook and a gardener… it’s just one of her many hobbies. Seriously, your mom rocks! Has she ever thought of selling such original creations? Thanks, Chris. I’ll pass that along. She’s loving all this adulation… thankfully she’s so unjustifiably humble that there’s no risk of her getting a big head. Being the capitalist that I am, I’ve encouraged a cake-making side business, but she has less than no time available for that sort of thing. Your mom has nice hands… any face pics? does she have a myspace? No, digg lurker, she probably thinks “my space” is where she keeps the canned goods in the kitchen. 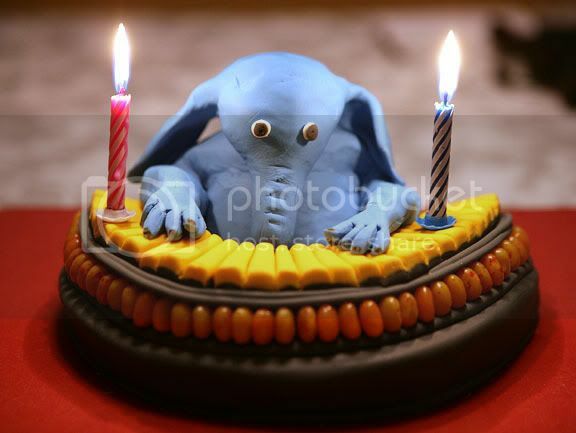 I got an X-Wing cake on my seventh birthday, but this… This is something else. Thanks, Gog. My Mom barely understands this “Internet” and “Digg” thing, but she’s appreciating all the compliments. At least you had a good 7th birthday. 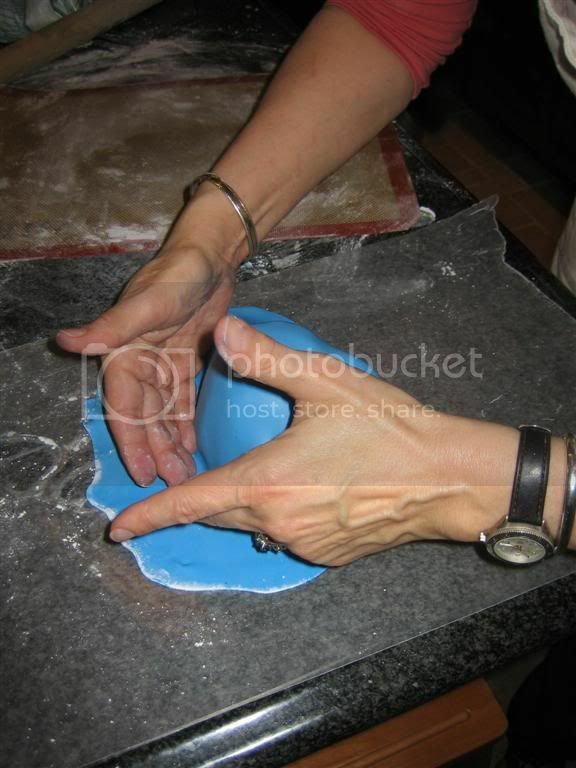 Did you make the fondant – because if it was store bought, I don’t envy the person who had to eat it. That stuff looks good, but out the the store premade stuff is nasty. Anyway, cool cake!! Ouch brotha, your pics are broke now. Aw, all the pictures have disappeared. You ought to host them on Flickr. When will people learn that image shack blows? GWS, any chance of getting a taste of Rebo, or his keyboard? Wanna see if it tastes as good as it looks! Woah man they all look like frogs, that’s AMAZING. I think I saw a frog on Degoba. 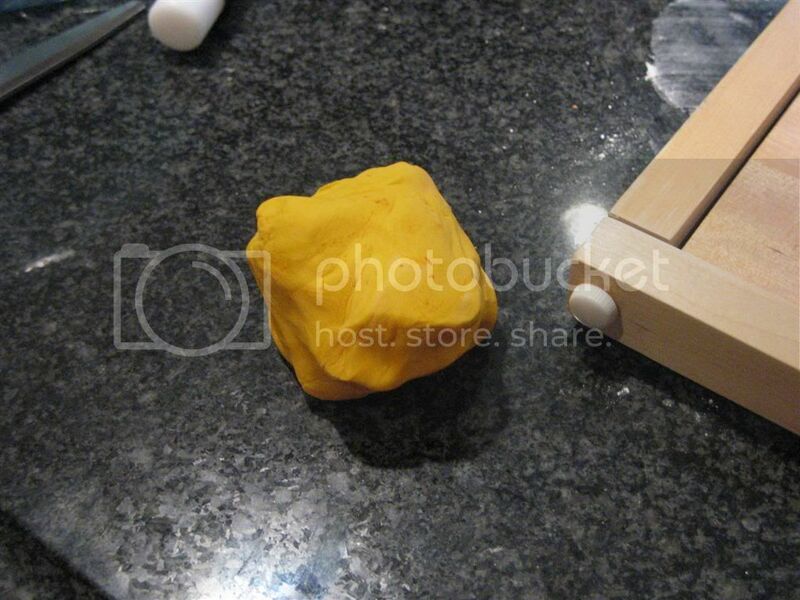 Kendra, don’t know if the Mom-person made the fondant or bought it. Seabreezeman: Some people learn the hard way about Imageshack and its blowage. All hail Photobucket. Thats a really cool cake! 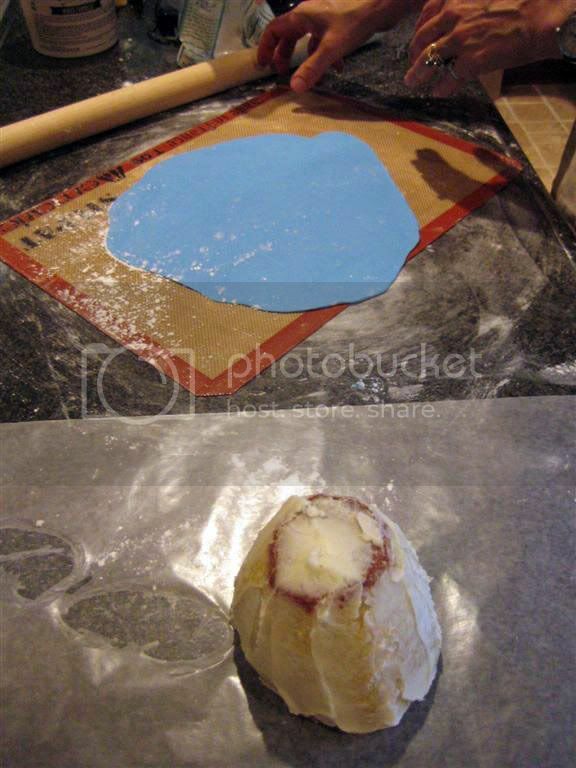 It’s mentioned above…The parts are made of “fondant” which is sort of a chocolate smooth type icing I beleive. Yuo’ll see a lot of wwedding cakes made with icing like this these days vs. the traditional whipped and buttercreme icings. Someone shoud pitch GWS’ Star Wars cake to the Letterman show or something. and, LO, the cake wars were ended by a few mere strokes of frosting from a true master…lol…jk…enjoy! Not as stunning as your mom’s creation, but it was my first attempt at fondant. And I had to make it from memory right after seeing the movie (there weren’t really any photos of it online). 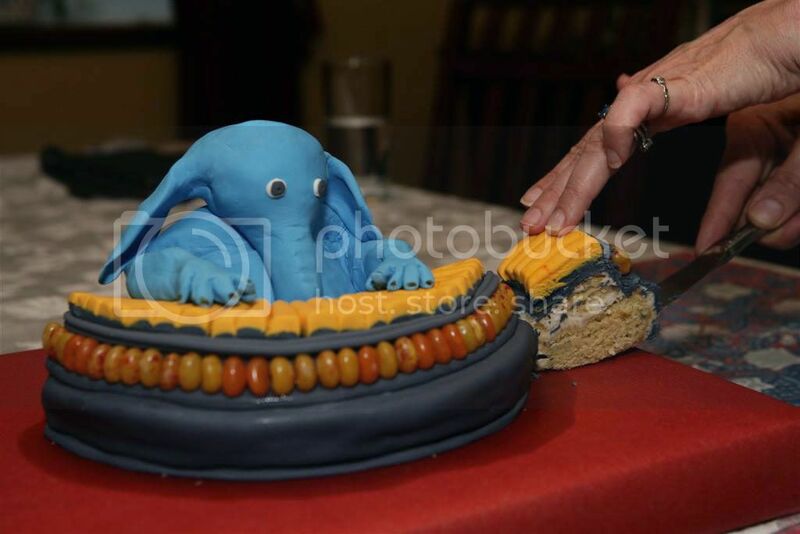 Honestly, I am STILL mesmorized by this Max Rebo cake. I can’t stop looking at these photos. I think you should make postcards out of the one with the two candles in it. this made me hungry !!! Next post: “Sheepery” (n.): An unforeseen factor causing the ruination of a project, effort, or state-of-being. Previous post: BABE Rally 2007: A road rally that’s really not as good as it sounds.